Sierra Riley, 20, of Zion, was killed in a single-vehicle crash on Route 41 in Lake Forest last week | Photo: GoFundMe. Lake Forest police said that speed was a factor in the single-vehicle crash on Route 41 last week that left a 20-year-old Zion mother dead and three others injured. Lake Forest Deputy Police Chief Rob Copeland said that a four-door Buick sedan was traveling northbound on Route 41 on March 29 at 3:56 a.m. when it drove off the right shoulder north of Westleigh Road. The vehicle struck several trees and came to a rest down a steep embankment where it caught on fire. Paramedics pronounced Sierra Riley, 20, of Zion, dead at the scene and transported three other victims to area hospitals. Copeland said that Christopher Lewis, 30, of Zion, and Rickey Matthews, 27, of North Chicago, were transported to Advocate Condell Medical Center in Libertyville and then both transferred to Loyola University Medical Center in Maywood where they remain undergoing treatment. Hisani Wright, 21, of Grayslake, was transported to Advocate Condell Medical Center where she was treated and released. She was wearing her seatbelt at the time of the crash and received only minor injuries. Copeland said that Lewis was the driver of the vehicle and a preliminary examination by investigators and witness reports indicate the vehicle was driving over the 45 MPH speed limit. The crash happened at a part of Route 41 where the road turns sharply left and then right again to curve underneath the railroad viaduct. 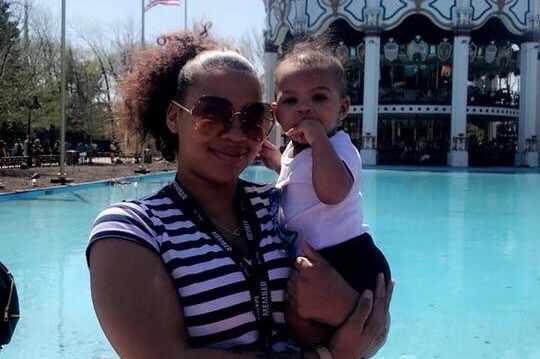 According to a GoFundMe post, Riley was a mother to a 1-year-old child. A criminal investigation into the crash remains ongoing by the Lake Forest Police Department, Lake County Major Crash Assistance Team and the Lake County Coroner’s Office.